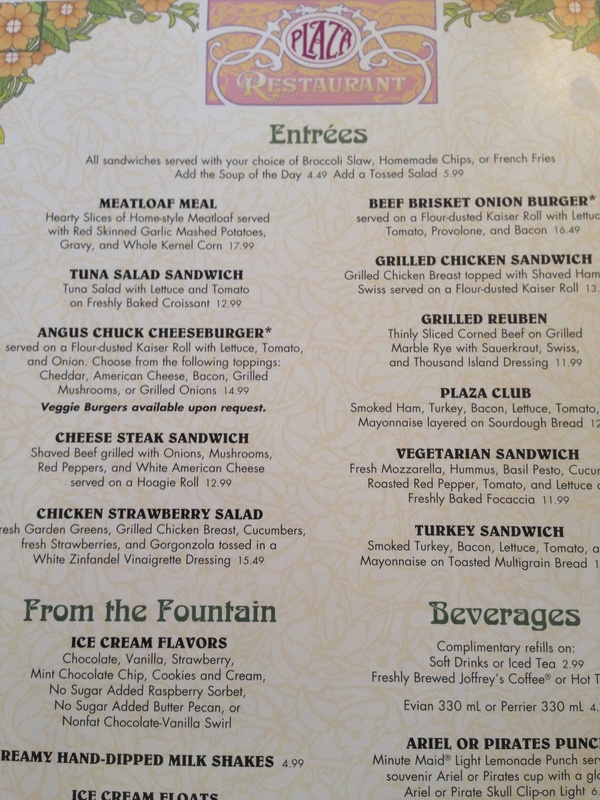 If you are in the mood for some down home cooking, you can’t go wrong at the Plaza Restaurant in the Magic Kingdom. It’s probably one of the Magic Kingdom’s Hidden Treasures because it’s off the beaten path. Located at the very end of Main Street USA as you enter the park, it’s not even on the corner but around the corner and to the right. The signage isn’t very noticeable either – just an unobtrusive “Restaurant” sign stands out prominently with the word “Plaza” written in fanciful script above it. But the sign is placed in the middle of the railing above it so it kind of blends in unless you’re looking for it. Maybe that’s for the best because if more people saw it, more would eat there and it would become super difficult to get a reservation! 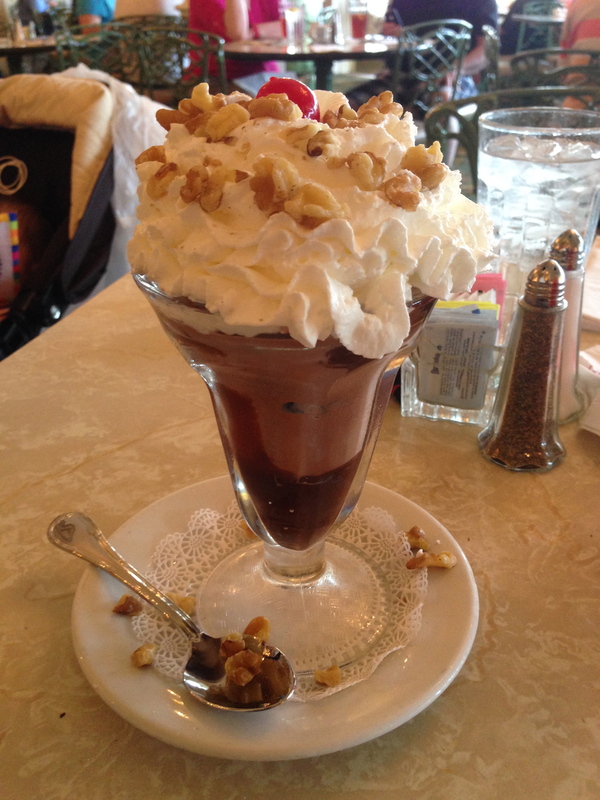 Topping off the meal with a classic hot fudge sundae – just the best! As it is, it wasn’t difficult to reserve a seat. The restaurant is cozy and the atmosphere reminds a person of turn of the last century decor. The service is stellar and the food is high quality as well as tasty. 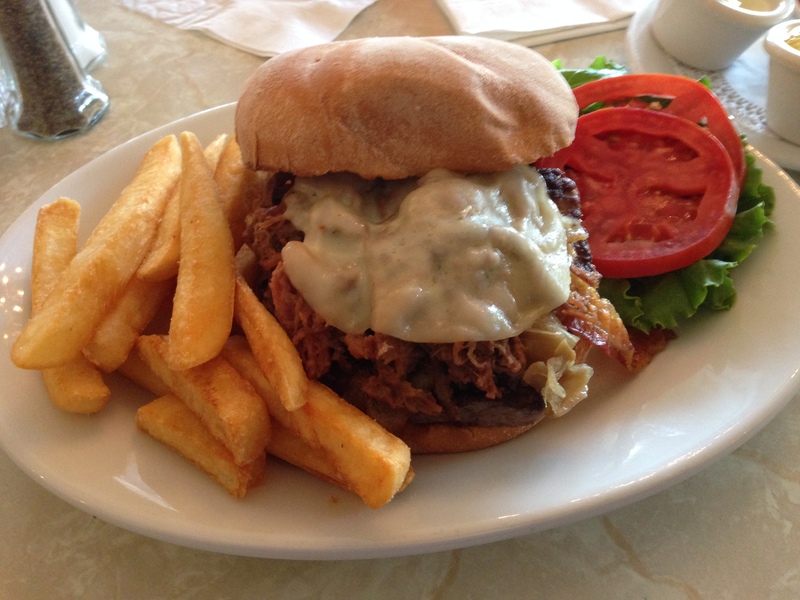 The beef brisket onion burger is an explosion of meaty flavors in your mouth. Combining a burger patty with beef brisket and bacon may seem like a lot of meat (and it is) but the flavors meld together, heightening each one without disrupting the taste of the others. It was plenty of food to fill up even the most hungry person. The fries were hot, crispy on the outside and tender on the inside without being greasy. Topped off the meal with a hot fudge sundae with chocolate ice cream (your choice of flavors). It was rich without being overwhelming. The fudge was chocolatey without being clumpy and the whipped cream and nuts were the perfect compliment to a traditional dessert. One of the best features of this restaurant isn’t in the decor though. It’s in the menu. The choices are varied and so many seem tasty and yummy. Mostly serving sandwiches, there are other options – the meatloaf meal and the chicken strawberry salad for those not in the sandwich mood. But again, calling these meals simply sandwiches or burgers is doing a disservice to the quality provided in each one. The experience is like having the most incredible old-fashioned meal you could imagine with your best girl (or guy) in a 50’s malt shop complete with delicious floats, shakes, and sundaes. If you’re looking for something delicious that will fill you up and at a reasonable price, consider coming to the Plaza Restaurant!